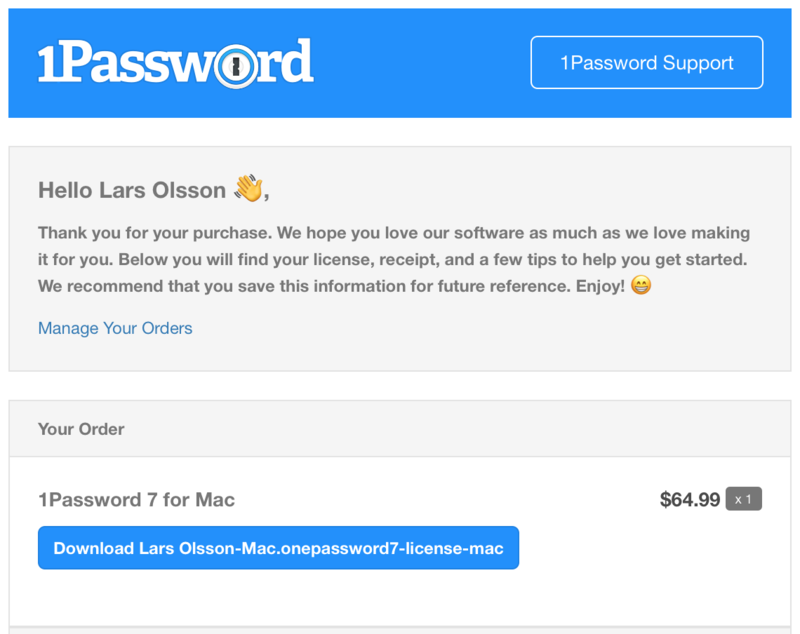 I purchased the standalone 1Password7 for Win. I got a mail from 1Password for my reciept. I downloaded and installed it. However I could not download the license file from the email, so I could not register the standalone 1Password7. I want to download the license file from the email by clicking. How should I do it? Click the bottom, blue button to download and install your license. Is that what you already tried? If so, what happens when you click the button? I tried to click the blue button, but couldn't click it..
@danbeiful - are you able to click the "Manage your Orders" link in the email you received? Thank you for your reply. I can open the link "Manage your Orders". However I could not click and download the license file.